Entries from Digital Intelligence tagged with "online adspend"
Facebook is rolling out device targeting to its Mobile App Ads platform, allowing advertisers to segment users by handset model, OS version and how users are connected to the internet. The update is being rolled out to advertisers over the next few days. 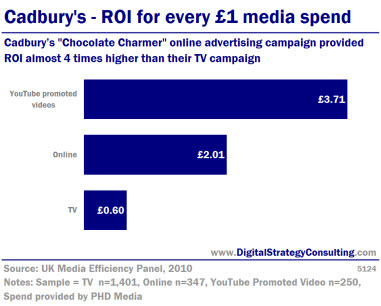 Cadbury's "Chocolate Charmer" online advertising campaign provided ROI almost 4 times higher than their TV campaign. Market research agency GfK NOP has released the results of a study that evaluated the cross media performance of Cadbury’s recent Dairy Milk campaign. The study demonstrated the power of online advertising and its ability to deliver impressive returns on investment. The money spent on internet ads in the UK increased 10% in the first half of this year, with advertisers spending a total of nearly £2bn on the medium, according to new data. The study, from the IAB and Price Waterhouse Coopers , found that video and social advertising fuelled online display’s return to growth, while the FMCG and Entertainment sectors ramped up investment to become two of the biggest spenders in the sector. The boom in online video, social and ‘performance’ marketing contributed to the 10% increase in online advertising spend during the first half of 2010 (compared with the same period of time in 2009), which saw UK marketers invest £1,968.6 million, lifting the medium to a record market share of 24.3%. The return to double-digit growth for the internet mirrors the general recovery of the entire advertising industry, with total UK expenditure increasing 6.3% to £8.1 billion between January and June 2010. Paid for search dominates with two-thirds of the digital advertsing spend during the first half of 2009. Global ad expenditure in 2009 will fall further than originally anticipated, according to a new report. Zenith Optimedia forecasts that expenditure would drop 9.9 per cent during the year, compared to its earlier prediction of 8.5 per cent. However, the report said that the figure disguised the fact that the downturn seemed to be bottoming out. The report said that internet was the only medium set to grow in 2009, by 9.2 per cent, with all other media shrinking. UK ad spend may be bottoming out, with spending on traditional media advertising falling by the smallest amount for the past six quarters and online ad spend showing its first increase since 2008, according to a new survey. The IPA/BDO Bellwether survey for the thrid quarter of 2009 indictes that British companies' spending on advertising fell for the eighth quarter in succession in the third quarter, but the reduction in budgets was the smallest seen for a year. 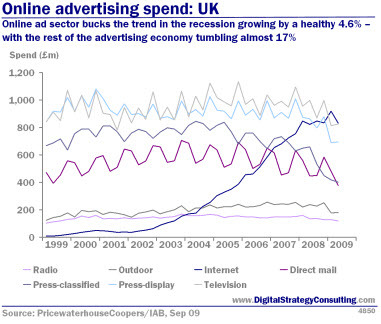 Online ad spending showed an increase for the first time since H1 2008, the survey found. 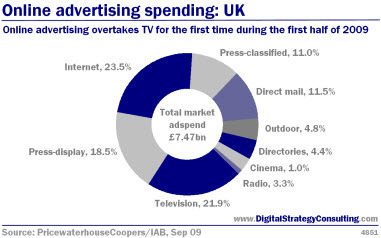 Online advertising overtakes TV for the first time during the first half of 2009. Online as sector bucks the trend in the recession, growing by a healthy 4.6%- with the rest of the advertising economy tumbling almost 17%. The UK online ad sector grew a healthy 4.6% to £1.75 billion in the first half of this year. Figures out today from PricewaterhouseCoopers and the IAB confirmed online bucked the trend in the recession - with the rest of the advertising economy tumbling almost 17% over the same period. That’s consistent with growth rates about 20% above the total ad sector. Online advertising took 23.5% of all UK adspend in the first half of the year, extending its lead over other media and confirming it is now significantly larger than the television ad industry. The UK remains the most mature online advertising economy in the world with the highest market share of ad spend going online. Internet advertising is expected to account for about 15% of global measured advertising spending in 2010, up from an anticipated 13% in 2009, according to new report. The study, from GroupM, found that growth in display ads has fallen over the past several years as supply has run ahead of demand. In 2010 the report predicts that display spending is expected to hold a 34% share of online advertising, down from 35 percent in 2009, 37% in 2008, 38% in 2007 and 39% in 2006. By contract, spend on search ads has grown from a 38% share in 2006 to an anticipated 43% in 2010. The overall 15% figure represents an estimated $64.7bn (£39.72bn) globally and is an 11 percent increase over the previous year’s total. PricewaterhouseCoopers's (PwC) latest Entertainment and Media Outlook report predicts that online advertising in the UK will take 36% of all adspend by 2013, writes Brand Republic. According to the firm, online ad expenditure grew 17.1% (£540m) year-on-year during 2008 to reach £3.35bn, giving it 19.2% of the UK ad market (from 15.5%). The report also predicts that the UK's total internet access market (including both wired and mobile) will grow at a compound rate of 7% between 2009 and 2013 to reach £8.84bn (from £6.32bn). PwC expects the UK's entertainment and media market to decline until 2010 before growth resumes. Not all sectors will fully recover however: PwC forecasts that the only sectors which will be larger in 2013 than in 2008 are internet access, internet advertising, TV subscriptions and license fees, filmed entertainment and video games. The latest European online advertising study from IAB and PricewaterhouseCoopers (PwC) has revealed that online adspend grew 20% during 2008 to reach €12.9bn (£11bn), writes Brand Republic. The study examined the markets in 19 European countries. Although some mature markets showed less than 20% growth, only France and the Netherlands came in below 19% (with 18.5% and 9% respectively). Online search advertising led the way with 26% growth, rising to €5.6bn (£4.8bn). Overall, search accounted for 43% of all European ad budgets in 2008 (from 41% in 2007). Classified adspend was up 17% on 2007 (to take 25% of all advertising), reaching €3.8bn (£3.25bn). Display advertising increased 17% to €3.3bn (£2.82bn) and email spend remained flat at €200m (£171m). New research from TNS Media Intelligence shows that online display advertising in the US grew 4.6% in 2008, writes ClickZ. According to the firm, internet advertising was one of only five sectors which saw positive growth during the year. Only syndicated television (up 6.5%) and Spanish-language magazines (up 4.9%) saw higher growth than online. Total advertising expenditure for the year was down 4.1% in the US to reach $141.7bn. Newspaper advertising saw the biggest drop, falling 11.8% year-on-year (and down 16.5% in Q4 on 2007). Radio also saw sharp falls, declining 10.3% on the previous year.